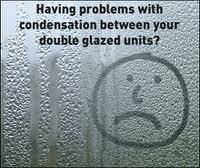 Double glazing units can break down which can ooften lead to misting or fogging on the inside of the glass where you cannot get access to clean it off. Double glazing units in double glazed windows are made up of two panes of glass stuck together. 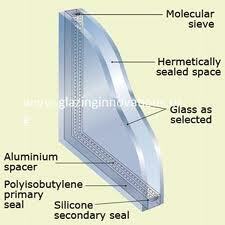 The panes of glass used in double glazed windows are collectively called sealed units. The panes of glass in the sealed units are kept apart by spacer bars (usually made of aluminium) These bars are perforated internally and hollow. They are filled with hundreds of tiny silica balls. (often found in the little bag you receive in the packaging of new electrical goods) It is these balls which soak up any moisture contained in the air between the two panes of glass. If the seal on the units breaks or fails, the silica becomes saturated and the moisture in the internal air gap will become condensation and will begin to mist, or fog up your double glazing units which will look unsightly, particularly from inside the building. This condensation and misting of the interns of the sealed units is a problem that generally needs professional attention. If the unit breaks down within the term of the manufacturers guarantee then the sealed unit should be replaced by the supplier, the sealed units are usually guaranteed for 5 to 10 years by the manufacturer, however unless you bought the units direct you should approach the supplier/installer who is responsible to you and let them sort out the manufacturers guarantee. If you do not have a guarantee there are many double glazing repair firms who specialise in the repair of double glazed windows. They can usually also repair the frames, hinges handles and doors. These company's will either repair the sealed units by drilling a hole in the glass and fitting a one way valve to allow the moisture to escape or some will replace the defective glazed unit complete. These firms are often called, Window Doctor or Double glazing Repair co etc and can be found online.